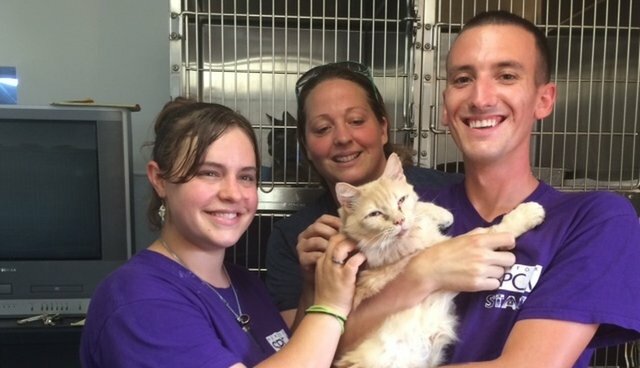 Staff at Virginia's Norfolk SPCA with one of the new arrivals from the Chatham County, N.C. rescue. The SPCA took in several dogs and cats from that case. With our immense task of helping animals at risk in so many different sectors, it's critical to foster strong collaboration among like-minded people and organizations. There's strength in numbers, and so many important gains and defensive maneuvers require coordinated, collaborative efforts, whether we're fending off ag-gag bills, banding together to get the major airlines to stop shipping trophies of the Africa Big Five, or working to shift public sentiment on the use of elephants and orcas and other wild animals in archaic performances. A short time ago, I wrote on the blog about the dizzying array of animal care programs of The HSUS and its affiliates, which collectively provide services to more than 100,000 animals annually. At the time, I noted that our Animal Rescue Team was on the ground in North Carolina with Chatham County Animal Services and many local and national partners to rescue nearly 200 animals from a severe crisis. Over the past few weeks we have been working with our Emergency Placement Partners in North Carolina to place the animals from that case, with several going to Safe Haven for Cats, SPCA of Wake County, Red Dog Farm, Horse Helpers of the High Country who also assisted in the rescue, and Carolina Waterfowl. The remaining animals arrived recently at the Washington Animal Rescue League and at Virginia based organizations – the Norfolk SPCA, the Virginia Beach SPCA, Angels of Assisi, and Lost Dog and Cat Rescue – ready to take the next step in their journey to a new life. We now have 250 organizations as Emergency Placement Partners, and each one serves as a vital link in a broader effort to rehabilitate the victims of neglect and cruelty and place them in loving, permanent homes. The HSUS helps provide our partners with funding and supplies for the care of the animals that come from our cases, but these partners make great contributions and sacrifices, too. I am always heartened to see that the media attention our Emergency Placement Partners receive whentaking in animals from high-profile cases gives a big lift to their existing adoption efforts and their visibility, with some partners reporting record adoptions weeks after participating in a large-scale case. The HSUS is in touch in so many ways with the sheltering and rescue community – at our animalsheltering.org/training-events/expo/">Animal Care Expo, through Pets for Life (we are partnering with groups in 30 communities), with resources that encourage pet adoption, our Rural Area Veterinary Services programs in so many remote places, by providing guidelines, training, networking and forums to elevate the work of rescues across the country, and via animalsheltering.org. We are also so pleased to partner with Maddie's Fund and the Ad Council on the national adoption program campaign, the Shelter Pet Project, which has generated more than a quarter of a billion dollars of advertising to promote the adoption of homeless animals from shelters. And we are working with so many local organizations in our battles against puppy mills, dogfighting, and other problems that afflict animals in communities. We are proud of these touches, and of the critical work these organizations do. Building a movement requires this level of cooperation, and the animals deserve our best collaborative efforts every day.